On behalf of our community… I am sending thoughts, prayers, condolences and love to the family and friends of Fran Zilko. I was soooo very sad to learn that Fran, who had successful aortic valve replacement surgery in 2010, passed away after a fall and issues with her kidneys, lungs and heart. Born in 1939, Fran was a nurse, a wife to Peter, a mother to Christine, Teresa and Stephen, and a grandmother to Michael, Katya and Frances. At HeartValveSurgery.com, Fran was an extraordinary support engine for so many patients in our community. Fran joined us in 2010 as she prepared for aortic valve replacement due to aortic stenosis and atrial fibrillation. Her willingness to share her story and help others was boundary-less. I was “wow’ed” by the strong bonds that Fran formed with other patients. Seeing her posts inspired me to continue building our community. The special friendships that Fran formed at HVS transcended this website. That’s right. Fran and several heart valve patients from HVS would get together for “Spring Break” in Florida. 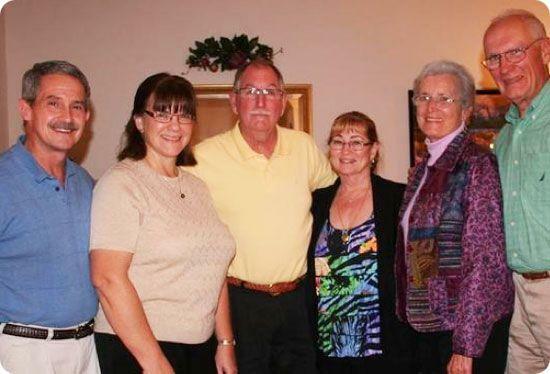 I’ll never forget seeing the smiling pictures of Fran, Peter, Duane, Cheryl, Duane and Peggy together. Simply wonderful! There are no perfect words t0 write in moments like these. There is sorrow. There is loss. But, there is thankfulness. I am thankful for Fran. I am thankful for her spirit. And, I’m so thankful to Fran for helping me learn how to be of more service to others. A memorial service will be held Wednesday, December 5th, 10:00 AM, at St. Katharine Drexel Parish, 1922 SW 20th Ave., Cape Coral, Florida 33991. In lieu of flowers donations can be made to Feed My Starving Children or the Harry Chapin Food Bank. My thoughts and prayers are with Fran!